When Google Drive was officially launched, I wrote up a basic overview of how you potentially could be backing up your computer to gDrive…and integrating this into collaboration with students and colleagues. By now you hopefully have taken me up on installing gDrive to your computer and have synced your docs to the cloud. Let’s take a look at using this “back-up” system as a tool for workflow. I’m a big fan of the of Google Apps for Education in the classroom. I built an entire program using Google Apps, Google+, Chromebooks, etc. I also use Chrome as my browser of choice on my computer. Chrome is fast, clean, and has a ton of great “extensions” and “apps” that you can add-on to enhance your web browsing experience. I recommend installing Chrome on your computer and using it for a week to see if you like it. This does not mean you should uninstall your current browser of choice (Firefox, Safari, Internet Explorer). Leave them installed on your machine, but install Chrome and test drive it. I use Chrome because I am an Android user. I thoroughly use gMail, Google Calendar, and Google Docs. I also now use gDrive. Chrome is also available on my Android phone, and it will sync everything…including what pages I currently have open to my phone. I do most of my RSS reading, and communication on my phone…so this is great. Because of these factors…Chrome works very well for me. I also like Chrome because I have it set up so that I can type a search term right in the URL address bar and it’ll search Google right away…this is great. If I could alternatively also have it switch over to Google Scholar…it would be incredible. Chrome also gives me little buttons on the start page, or on the browser frame which allows me to quickly check an new email message and archive it…or create a calendar event. For photos I prefer Pixlr Editor and Pixlr Express. For video…the WeVideo for Google Drive looks like a great way to collaboratively edit video…I haven’t really tested it that much as of yet. MindMeister is a collaborative “online mind mapping and brainstorming” tool. 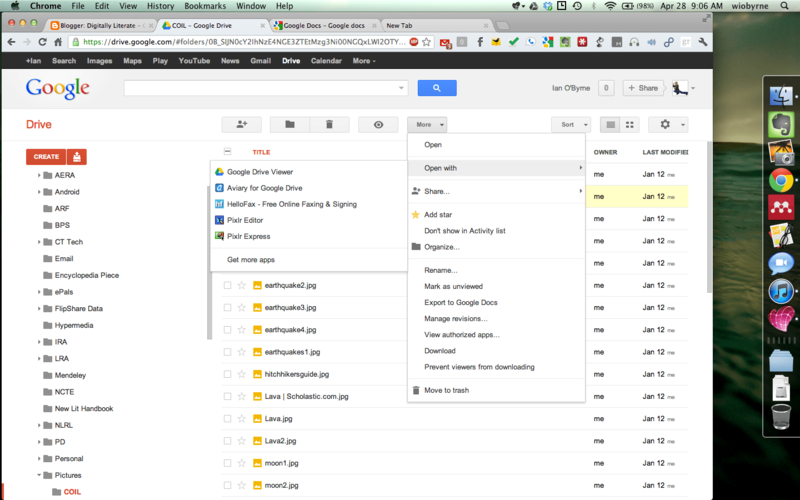 SlideRocket is a slick online presentation tool…however I’m too much in love with Google Presenter to switch over now. HelloFax seems like a nice way to deal with the times when I need to sign something and fax it out…and I’m always never near a fax. As the developers start working with Chrome and gDrive…I’m sure we’ll see more and more apps coming out. A couple other apps I use frequently on Chrome are MyChromeTheme, Feedly (for RSS on Chrome & phone), and Evernote (including the Web Clipper, and Clearly). Once you have an app installed, to use it, you’ll need to start it up by itself in Chrome to give it permission to “talk” to files in gDrive. You then can go to a specific file in gDrive, click the checkbox to the left of it…and then click on “More” to the top center of the page. This wil give you an option to “Open With…” You can select one of the apps that you just installed. Because gDrive at this point is only a week old, some of the functionality is slow, or buggy…but I would hope that this gets better over time. I would love to be able to continue using Google Docs as I have been for years…while I have access to all of my files in gDrive. Finally, having a “swiss army knife” of tools available within the browser makes my life a lot easier.